VAW-125, known as the "Torch Bearers" or "Tigertails," was commissioned on October 1, 1968, at Naval Air Station, Norfolk. The squadron's first assignment was with Carrier Air Wing Three (CVW-3) aboard USS Saratoga (CVA 60). While with CVW-3, VAW-125 became the first East Coast squadron to take delivery of the new E-2B "Hawkeye." 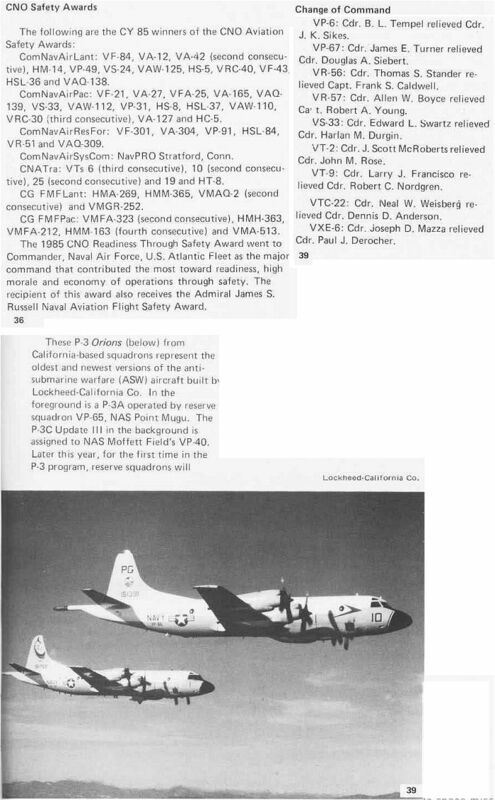 In December 1976, Vice Admiral Greed, COMNAVAIRLANT, presented VAW-125 with the COMNAVAIRLANT Battle "E" for readiness, the CINCLANTFLT "Golden Anchor" Award for career retention, and the CNO Safety "S" Award. 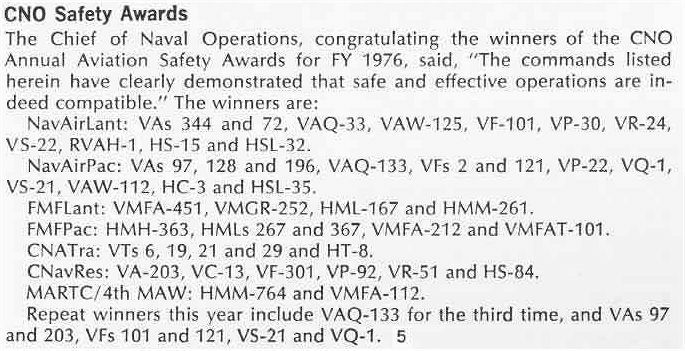 VAW-125 is believed to be the first Navy unit to win all three awards in the same year. In June 1978, VAW-125 took the newest version of the E-2C, the Advanced Radar Processing System (ARPS), to sea for the first time. In November 1979, the Tigertails joined Carrier Air Wing Seventeen (CVW-17) and made their eighth Mediterranean Sea deployment and their first aboard USS Forrestal (CV 59). While deployed in August 1981, VAW-125 took part in Freedom of Navigation Operations in the Central Mediterranean Sea, during which two Libyan MiG's were downed after attacking Battle Group aircraft. Upon their return from deployment, the Tigertails were selected to provide range control services for the second launch of the NASA space shuttle, STS-2. While on routine deployment in October 1985, the Tigertails played an instrumental role in the successful intercept of the Egyptian airliner carrying the hijackers of the Italian cruise ship, "Achille Lauro." In August 1988, the Tigertails were selected to embark in USS Independence (CV 62) for the "Around the Horn" cruise to San Diego, CA. In August 1990, the Tigertails responded to the invasion of Kuwait by deploying to the Red Sea with CVW-17 aboard USS Saratoga. They took up station and started flying around the clock in support of Operation DESERT SHIELD. VAW-125 flew over 890 combat hours controlling strikes on Iraqi targets while providing AEW coverage for the Red Sea Battle Group. The Tigertails controlled VFA-81 F/A-18's in the 17 January 1991 shoot down of two Iraqi MiG-21's – the only Navy air-to-air MiG kills of the Southwest Asia campaign. During their 1992 cruise, the squadron was involved in several exercises in Europe and supported United Nations' relief efforts during Operation PROVIDE PROMISE in the former Yugoslavia. In recognition of the achievements during this deployment, VAW-125 received the 1992 Battle Efficiency Award and CNO Aviation Safety Award. In January 1994, the Tigertails deployed aboard USS Saratoga for its final cruise. During the deployment, the Tigertails joined NATO forces flying in support of Operations DENY FLIGHT and PROVIDE PROMISE. The Tigertails conducted operational tests using the Navy's newest Mini-DAMA Satellite Communication Suite Prototype System. 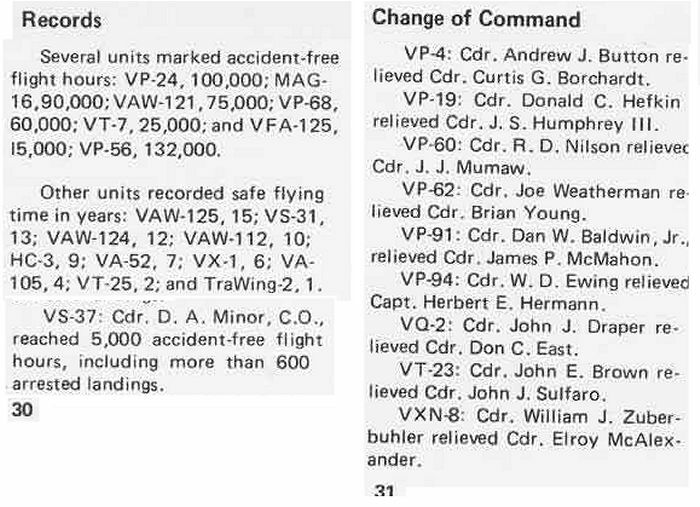 Using this new system, the Tigertails, for the first time, functioned as Airborne Battlefield Command Control Center (ABCCC). With the decommissioning of USS Saratoga, VAW-125 and CVW-17 joined USS Enterprise (CVN 65). After completing a two-month Counter-Drug assignment at Naval Station Roosevelt Roads, Puerto Rico, the Tigertails deployed to the Mediterranean Sea aboard USS Enterprise in June 1996. The Tigertails set the standard early during this cruise by earning the CVW-17 "Top Hook" Award for carrier landings. In March 1997, the Tigertails and CVW-17 joined the USS Dwight D. Eisenhower (CVN 69) Battle Group (IKEBATGRU). Deploying in June 1998, the Tigertails immediately supported Operation DELIBERATE FORGE in the Adriatic Sea. When the former Yugoslavia remained fairly passive, the IKEBATGRU participated in numerous NATO and allied exercises and supported Operation SOUTHERN WATCH in the Arabian Gulf, when heightened tensions resumed. The Tigertails were awarded the Meritorious Unit Commendation for their participation in this high paced deployment. In January 1999, the Tigertails and CVW-17 were assigned to the USS George Washington (CVN 73) Battle Group. In early June 1999, the Tigertails returned from a highly successful two-month Counter-Drug deployment to Naval Air Station Roosevelt Roads, Puerto Rico. The Tigertails proudly participated in the maritime intercept, boarding, and subsequent seizure and arrest of the motor vessels "Castor" and "China Breeze." The combined drug seizure was in excess of 20,000 pounds of cocaine, which was the largest Atlantic seizure in the Seventh District Coast Guard history during any fiscal year. In June of 2000, the Tigertails and CVW-17 deployed aboard the USS George Washington. During this most recent deployment the Tigertails played a vital role in Operation SOUTHERN WATCH, JOINT FORCE/JOINT GUARDIAN as well as NATO Exercise DESTINED GLORY 2000. 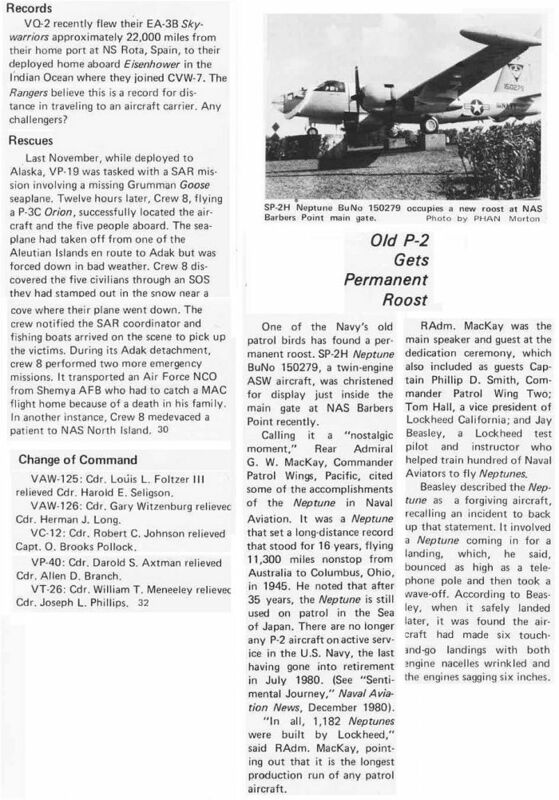 In February 2001, Vice Admiral Mobley, COMNAVAIRLANT, awarded VAW-125 with the COMNAVAIRLANT Battle "E" for readiness, and the ANA award for the best Fleet Support/Special Mission Squadron. The Tigertails have surpassed a remarkable 32-year mishap-free milestone of over 64,000 hours, and are currently preparing for their upcoming deployment. The squadron's past performance is exceeded only by its future potential. VAW-125 stands ready to meet its worldwide commitments and responsibilities in the long-standing Tigertail tradition of being "Torchbearers" for our nation's forces, and writing the next chapter in the storied history of the US Navy's finest and most capable E-2C Hawkeye squadron.